somewhere in a parallel universe i am in a diane von furstenburg wrap dress and high heels, checking out halston and bianca jagger while dancing to evelyn “champagne” king at the 54. i don’t know what it is about the seventies but it’s in me, and it ain’t going nowheres. 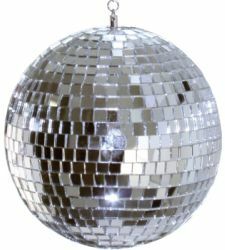 anyway, imagine the awesome parties that could effortlessly come together, once you grab up one of these solar-powered disco balls. no need for batteries or a plug – just place this wee little 18″ h x 6″ w ball on a window with the attached suction cup, and watch the area transform into a place where stretch sequin tube tops are preferred and velvet ropes are required. away it will whirl, creating a shimmering glittery effect all over. summer evenings will never be the same. it’s groovy and it’s eco friendly too, people – what more can you ask for? find it at fred flare or mxyplyzyk. Groovy AND eco friendly? What more could we ask for, indeed! I’ll be Olivia Newton John in Xanadu. Gawd I loved that song. Way to bring a little party into everyday life, without using electricity to boot.